The upper gastrointestinal (UGI) procedure includes radiographic and fluoroscopic evaluation of the esophagus, stomach, and duodenum while the patient is drinking a barium solution. Barium is completely inert, not absorbed, and not allergenic. The liquid barium has a chalky taste, although the taste can be masked somewhat by added flavors such as strawberry or chocolate. Spot films are obtained in various projections during the dynamic portion of the study. Subsequent to this, routine overhead films are obtained. Three approaches are commonly used. 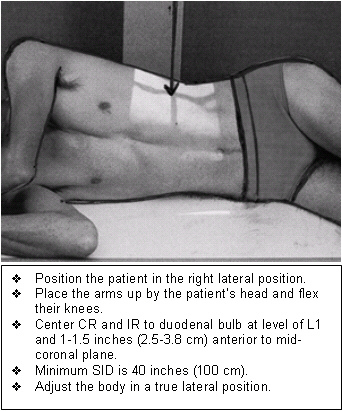 Biphasic upper GI examination (both single- and double-contrast incorporated together). Single-contrast UGI overhead image of right lateral stomach with patient in right lateral position. Image courtesy of Dr. Naveed Ahmad. In a single-contrast UGI examination, the outline of the barium-filled viscous provides the most apparent information, enabling any lesions causing contour defects such as large tumors and ulcers to be easily seen. However, small lesions such as small ulcers and polyps require fluoroscopically guided compression. Compression is critically important in the detection of these small lesions. The single-contrast UGI series uses a medium-density barium suspension that permits a combination of meaningful compression filming. Kilovoltage for most single-contrast studies should be in the range of 90-110 kVp to allow adequate penetration. Single-contrast UGI overhead PA film. Note that the stomach is imaged at the superior aspect of the film so as to visualize as much of the small bowel as possible. Image courtesy of Dr. Naveed Ahmad. Prone film of the stomach and duodenum. 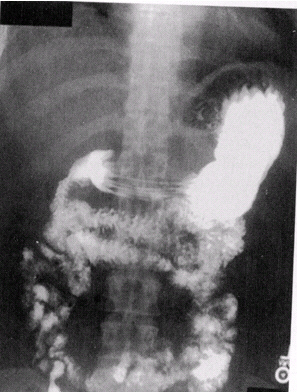 Right anterior oblique (RAO) film of the stomach and duodenum. Right lateral film of the stomach and duodenum. Supine film of the stomach and duodenum. Right anterior oblique position for gastrointestinal imaging. Image courtesy of Dr. Naveed Ahmad. To precede a small bowel series. Inability to tolerate biphasic UGI series (nausea, vomiting, decreased mobility). Assessment of gastric peristalsis or for gastric outlet obstruction. Evaluation of masses, varices, strictures, fistulas, or aberrant anatomy. If perforation is suspected, water-soluble contrast is used by convention. Stomach images in which the upper two images are obtained with compression. The bottom two images are superior body and fundus, which, being under the ribs, cannot be compressed. Image courtesy of Dr. Naveed Ahmad. The patient should be NPO (nothing by mouth) after midnight or for 6 hours prior to the exam. Scout film: not obtained routinely. Images of the duodenal bulb in four slightly different views (10 x 12 image receptor, 4 on 1). Image courtesy of Dr. Naveed Ahmad. With table vertical and patient in the left posterior oblique (LPO) position, have the patient drink 2 oz regular barium (60% w/v) and quickly scan the esophagus from the pharynx to the lower esophageal sphincter. Keep the tabletop vertical and patient LPO, and image the stomach with compression to reveal the gastric folds. If the folds are difficult to see, decline the table to 45° and compress again. The superior body and fundus are under the ribs and cannot be compressed. Bring the table to the horizontal position to image the fundus. With the table head down -20°, obtain a single contrast esophagram by having the patient drink 4-6 oz regular barium (60% w/v) to fill and distend the esophagus, and obtain images of the proximal esophagus, midesophagus, and the distal esophagus with patient in RAO position. With the tabletop horizontal and patient in right lateral position, image the duodenal bulb. 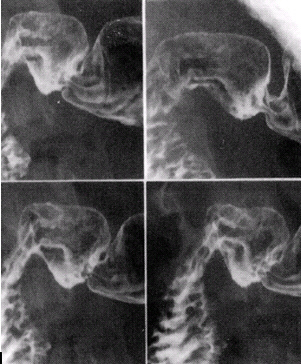 Visualize the barium-filled duodenal bulb and obtain at least four slightly different views. If the bulb is not well seen, have the patient inhale deeply and stop breathing briefly to improve visualization of the bulb. Alternatively, the patient can be placed prone and the duodenal bulb can be compressed from underneath by using a balloon compression paddle. 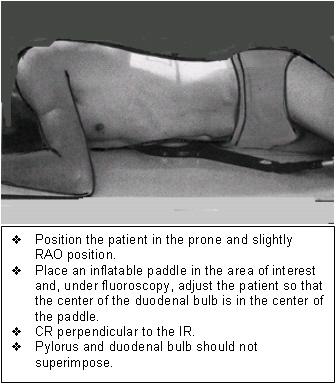 With the table horizontal, image both the stomach and duodenal bulb in the right lateral or RAO position. Alternatively, the technologist can obtain this image as an overhead film. Obtain an overhead PA film. The stomach should be positioned at the superior aspect of the film, so as to visualize as much of the proximal small bowel as possible. Left posterior oblique position for stomach and duodenum imaging. Image courtesy of Dr. Naveed Ahmad. 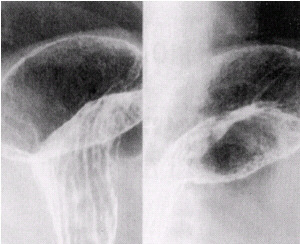 Reprinted from Merrill’s Atlas of Radiographic Positions and Radiologic Procedures, 9th edition, Ballinger and Frank, page 112 (figure 17-42), copyright 1999 Mosby, with permission from Elsevier Science. Right lateral position for stomach and duodenum imaging. Image courtesy of Dr. Naveed Ahmad. 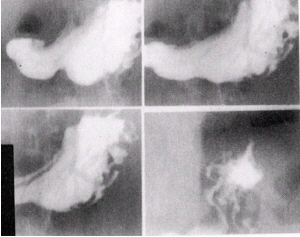 Reprinted from Merrill’s Atlas of Radiographic Positions and Radiologic Procedures, 9th edition, Ballinger and Frank, page 114 (figure 17-44), copyright 1999 Mosby, with permission from Elsevier Science. 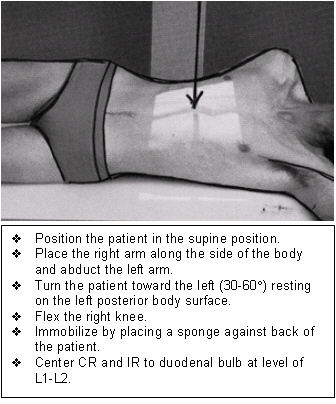 Right anterior oblique position for stomach and duodenum imaging. Image courtesy of Dr. Naveed Ahmad. NPO after midnight or 6 hours prior to exam. Perform a routine single-contrast UGI series. Have the patient drink 8-10 oz of additional regular barium. With the tabletop horizontal, obtain overhead posteroanterior (PA) abdominal films at 20-minute intervals until barium reaches the cecum or ascending colon. It may be necessary to have the patient drink additional barium periodically to keep the stomach and proximal small bowel opacified. When the jejunum and ileum are well visualized, keep the tabletop horizontal, and obtain one or two anteroposterior (AP) spot films of jejunum and ileum using a compression device to separate the loops. 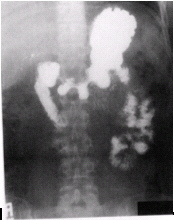 After barium is visualized in the cecum or ascending colon on the overhead films, obtain 2 or 3 compression views of the ileocecal valve and the terminal ileum. The ileocecal valve and the terminal ileum can be seen best in most patients by turning them slightly LPO and compressing. Anteroposterior position for stomach and duodenum imaging. Image courtesy of Dr. Naveed Ahmad. The double-contrast examination is a general study of the upper gastrointestinal tract from the pharynx to the duodeno-jejunal flexure that employs coating the mucosa uniformly with barium. A relatively small quantity of high-density barium (200-250% w/v) is used to demonstrate fine mucosal detail, and distension and double contrast are achieved by means of a gas-producing agent. Double-contrast UGI, overhead PA film. The overhead view must include two or more loops of jejunum. Image courtesy of Dr. Naveed Ahmad. 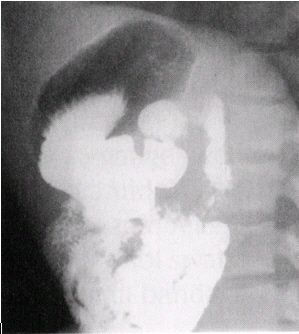 The biphasic examination is a commonly used modification of the double-contrast technique whereby an additional quantity of dilute barium is given toward the end of an examination and further films are obtained of the compressible parts of stomach and duodenum. The goal of the biphasic examination is to have both mucosal delineation in the double-contrast phase and full column distension in the single-contrast phase. The advantage of this method is that it images some lesions better than by double contrast alone. After the radiologist completes the fluoroscopic and spot filming portion of the examination the technologist usually obtains two overhead radiographs. Both of these are obtained at 120 kVp. A biphasic exam should not precede a small bowel series so as not to fill the small bowel with dense barium. Double-contrast image of gastric fundus in right lateral position. Image courtesy of Dr. Naveed Ahmad. 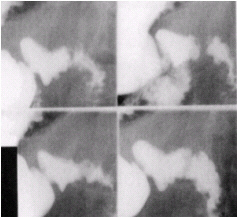 Double-contrast images of duodenal bulb in left lateral position in various obliques (10 x 12 image receptor, 4 on 1). Image courtesy of Dr. Naveed Ahmad. Administer 0.2 mg glucagon (intravenously if possible). Glucagon causes temporary paralysis of the gut, which reduces spasm and motion artifacts. With the tabletop head up 20-30°, perform a routine single-contrast UGI. Do not wait for the duodenal bulb to fill with barium, as the effect of glucagon rapidly diminishes. 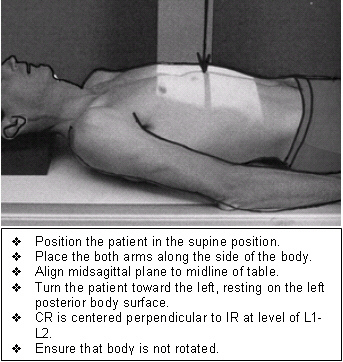 With the tabletop vertical, obtain a double-contrast esophagram. Pour the effervescent granules and 10 cc of water into the patient's mouth. With tabletop horizontal, have the patient swallow and then quickly drink 4 oz of dense barium. Caution the patient not to burp. As the patient is drinking, observe the esophagus for a "silver-satin" appearance, and obtain images of the proximal esophagus, midesophagus, and the distal esophagus in the LPO position. After obtaining the double-contrast esophagram, decline the table to horizontal, roll the patient to the prone position, and rock the hips from side to side 8-10 times to optimize mucosal coating. 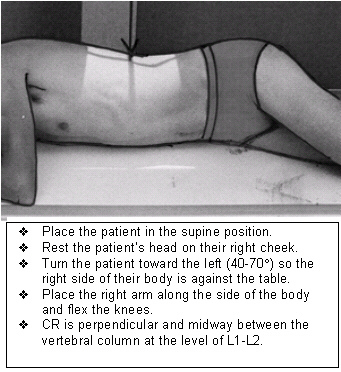 Pull the patient from prone to the LPO position to film the antrum, then the AP position to film the antrum and body. Take several slightly different views of these areas. Keep the table horizontal, move the patient to the right lateral position, and film the fundus. Keep the patient in the right lateral position until the duodenal bulb fills with dense barium, and then turn the patient to the left lateral position. When gas fills the bulb, take images in various obliques. 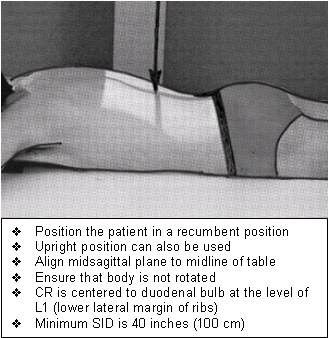 With the table horizontal, turn the patient to the right lateral position and image the stomach, which should be centered on the film. Alternatively, the technologist can obtain this image as an overhead film. Obtain an overhead film that includes the stomach, duodenum, and two or more loops of the jejunum. The exam is not complete until at least two loops of the jejunum are visualized.